The gratings are fabricated with approximately 700 nm between ridges. Each has slightly different spacing and thickness, affecting reflectivity and mechanical performance. Bottom: A single grating measuring 50 micrometers on a side. 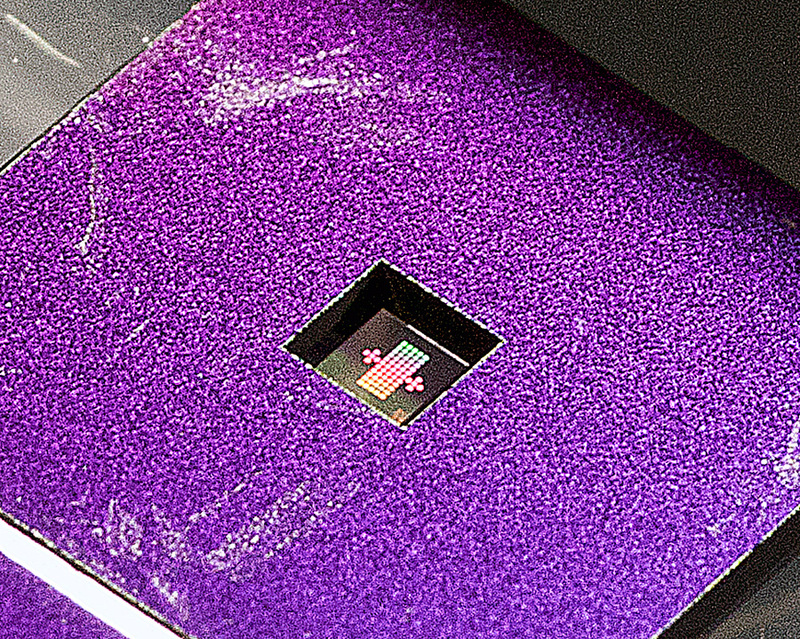 In the cut-out area of the purple mount, a silicon nitride membrane (which measures 1.2 mm X 1.2 mm) holds an array of gratings. The grating reflector is mounted at one end of a Fabry-Perot cavity which has a mirror on the other end. 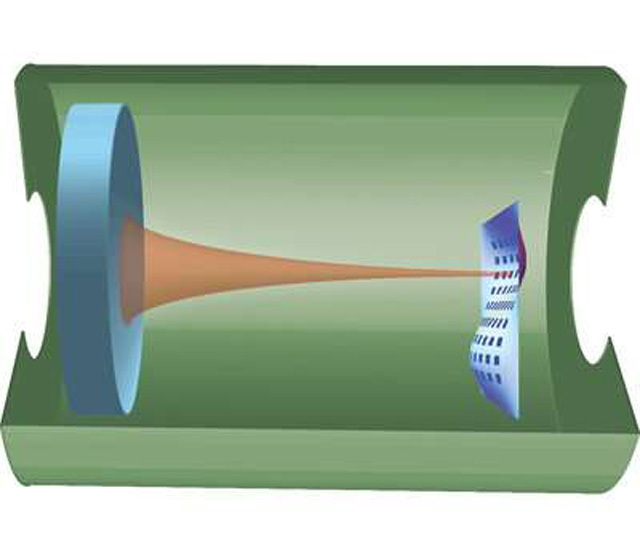 Then the entire device is placed in a vacuum chamber (right) and illuminated with laser light (red line) that enters the chamber through a port (inset) in the side. The output beam exits the chamber at a second port (far right) and is routed to a photo-detector. Scientists adjust the frequency of the laser beam so that it matches the cavity resonance condition at a particular time, and thus determine the performance characteristics of each individual grating. A team of scientists from PML's Quantum Measurement Division has designed and tested a novel device that may lead to substantial progress in the new and fast-moving field of optomechanics. That discipline studies and exploits the ways in which the feeble force of light interacts with very small mechanical objects. Or, as the team leader John Lawall says, "it involves coupling optical to mechanical systems in which the coupling is provided by radiation pressure." To be sure, the forces and motions involved are extremely small. But understanding and measuring them is important to projects ranging in size from the lasers and mirrors at the giant Laser Interferometer Gravitational Wave Observatory to the minuscule cantilever probes used in atomic force microscopy. 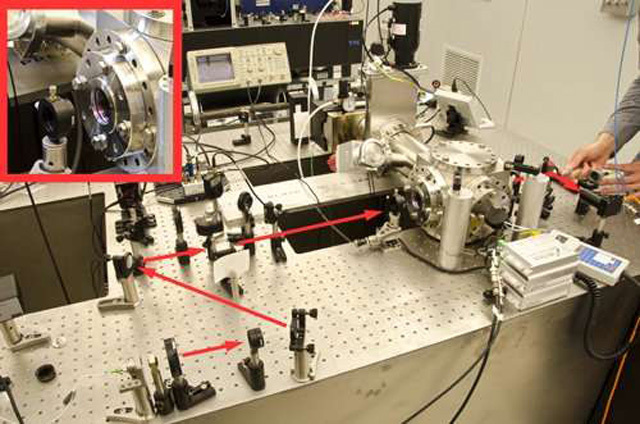 A typical lab setup for this kind of work involves an optical cavity with two mirrors: a fixed mirror on one end, and a movable mirror on the other. (See schematic below.) Laser light injected into the cavity reflects back and forth, pushing on the mirrors as it goes. The resulting displacement in the movable mirror changes the distance between the mirrors, which in turn affects the resonance frequency of the cavity. 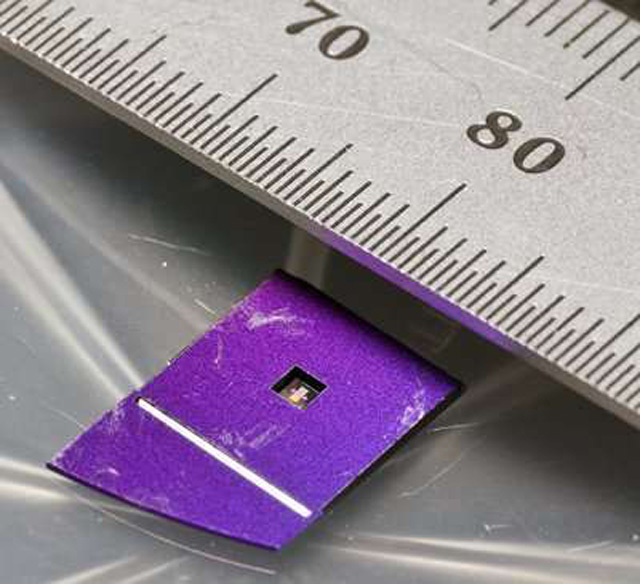 Most researchers use a moving mirror made up of 16 to 40 layers of dielectric film with different indices of refraction, culminating in a stack structure a few micrometers thick. That's not exactly huge. But "as you add layers," Lawall says, "the mass per unit area and the thickness just keep going up. And we need really low mass because the optical force is so weak." So Lawall, Utku Kemiktarak, Michael Metcalfe, and Mathieu Durand of the Quantum Metrology and Processes Group decided to take a completely different approach. 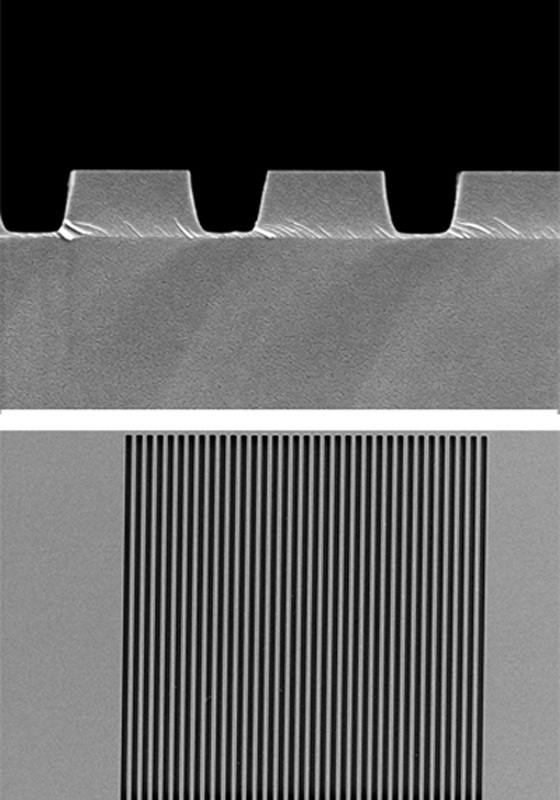 Metcalfe, a former postdoc in Lawall's group, pointed out that with careful design, gratings can work as mirrors as long as the spacing between the ridges is below the wavelength of light, which in the team's case is about 1560 nm. Eventually 81 such gratings, each with slightly different finger widths and spacings, were arranged on a single membrane. In this way the researchers could experimentally determine the reflectivity corresponding to a particular grating design, and choose a grating to couple optimally to a particular mechanical mode of the membrane. The result is a micromechanical reflector that is more than an order of magnitude less massive than conventional stack reflectors, has a mechanical quality factor (Q = 7.8 X 105) two orders of magnitude higher, and reflects 99.6 % of the incident light. "We are not the first people to use gratings as reflectors," says Kemiktarak, "but we think we are the first to study them closely for their mechanical properties as well as their optical properties." "These devices will likely be of great importance in MEMS devices and optomechanical systems employing radiation pressure," Lawall says. They may also be of considerable use in pursuing some of the most intriguing phenomena that occur when optomechanical systems approach quantum limits. For example, scientists are interested in preparing fabricated mechanical systems in a state of motion that is equivalent to the ground state (lowest energy level) of a single atom. That will require, among other things, elimination of virtually all the thermal noise in the system – difficult to achieve in mesoscopic conditions. "In order to get to the point where the system is down to only a few motional quanta, as opposed to 10 million or so, what you want to do is get rid of that thermal excitation," Lawall says. The brute force way to do that is just stick it in a cryostat. But in many cases, the temperatures you need are very low. Instead, you can turn to techniques that aren't terribly different from those employed to laser-cool atoms. "Basically, you can just take the excess thermal energy corresponding to mechanical motion and transfer it to the optical field via scattered light and therefore reduce the amount of thermal energy in the device itself." This research was partly supported by the National Science Foundation through the Physics Frontier Center at the Joint Quantum Institute. The research was performed in part at NIST's Center for Nanoscale Science and Technology.